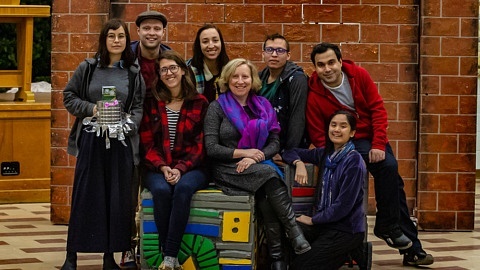 For their first review of 2018, the DARTcritics class attended Matt MacKenzie’s Bears, a co-production between Alberta Aboriginal Performing Arts and Punctuate! Theatre, in association with Native Earth Performing Arts at The Theatre Centre in Toronto. 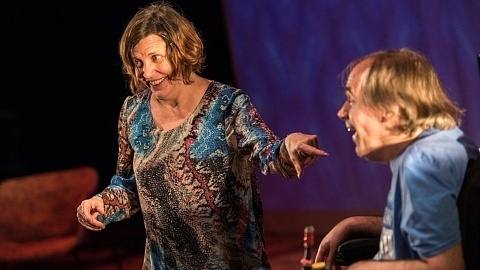 MacKenzie’s dark comedy is both an exploration of Indigenous cosmology and a political rallying cry against the Kinder Morgan Trans Mountain Pipeline – and all similar devastating attacks against Turtle Island and its inhabitants. Many may recall Enbridge’s Northern Gateway Pipeline project, which sought to build a new pipeline running from Alberta to British Columbia, as well as the staunch opposition it received from the mid 2000s to the mid 2010s. Those opposing were largely NGOs and First Nations groups, who were more than vocal about their disapproval. But there was also Bears. 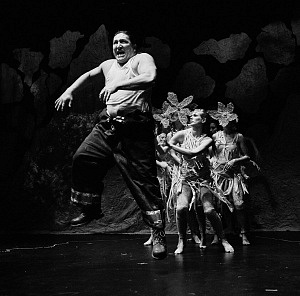 In 2015, Matt Mackenzie, with Alberta Aboriginal Performance Arts (AAPA) and the Rubaboo Festival, premiered the first iteration of his play: a multidisciplinary, cautionary narrative surrounding the potential negative effects of the Northern Gateway pipeline told by runaway Indigenous oil worker Floyd’s journey into nature. In November 2016, as The Toronto Star reported, the pipeline was permanently dismissed by the Federal Government – who then proceeded to approve the Kinder Morgan Trans Mountain Pipeline Project, which received approval for expansion construction this past August. This year, on January 18, the bear returned to the stage at Toronto’s Theatre Centre. The show, co-produced by AAPA and Punctuate! 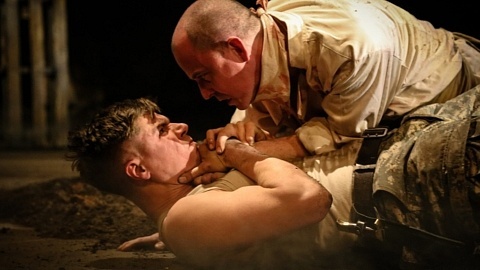 Theatre, runs until January 27 before returning home to the Rubaboo Festival. Christina Sokaymoh-Frederick and Sheldon Elter in Bears. Photo by Alexis McKeown. Mackenzie’s updated Bears follows Floyd (portrayed by Sheldon Elter) on his escape through the thick of the Canadian wilderness after becoming the main suspect in a workplace accident. He and the Chorus, a mischievous band of spirits playing various elements of the natural world, depict the vivid story of Floyd revisiting his days as a cub in his youth while he runs from the law, now regaining his spirit as an 800-pound Grizzly. Bears is a marvel, both aesthetically and as a feat of performance. Monica Dottor’s effervescent and humorous choreography of the Chorus mingles effortlessly with T. Erin Gruber’s environment design (including costumes, set, and projections). 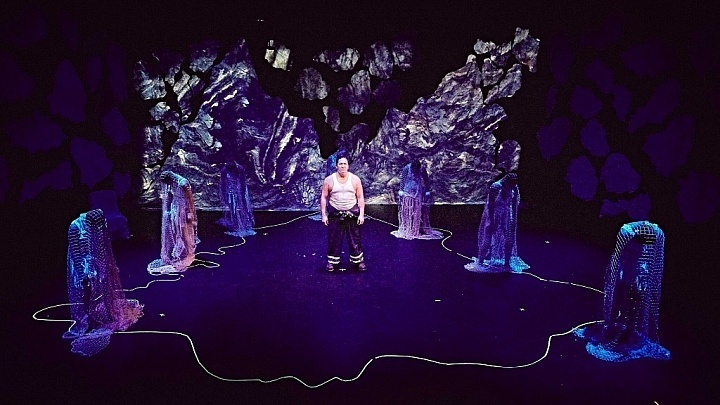 The set, comprising of a chair for Mama Bear (played by Christine Sokaymoh Frederick, co-founder and Artistic Director of AAPA) and cut-outs of minimalist Canadian scenery, creates a dynamic vision of Floyd’s changing surroundings. The eight dancers of the Chorus, including Gianna Vacirca and Lara Ebata, bring this world to life by dancing with Floyd, guiding, tricking, and accepting him as he rediscovers his place within nature. Sheldon Elter and chorus in Bears. Photo by Alexis McKeown. Elter is a powerhouse, never faltering for a moment – although Floyd does a few times. Clear and purposeful through the entire run, his voice is as expressive as the dancers. Floyd and the Chorus are constantly moving and working together to paint a moving landscape rich with political undertones of the reality of the Trans Mountain Pipeline. Bears entertains with a larger than life protagonist while warning of the consequences of actions harmful to the environment we rely on. It is a flourishing, complex narrative that never forgets where it comes from, and why it’s here. While its message is not bared until the final moment, Bears delivers a sorely needed warning on contemporary environmental concerns. With this touching and powerful lesson on human’s relationship to nature, playwright and director Matthew MacKenzie asks questions that echo long after Bears’ final defiant cry. Bears follows Floyd (Sheldon Elter), an Indigenous man wanted by the RCMP for a work place accident at his oil company, through his transformation into the titlular creature. Whether this metamorphosis is spiritual, physical, or merely a clever metaphor is left to the audience and their knowledge of Indigenous culture to interpret. Regardless, Floyd’s search for “bear country” delivers an unexpectedly rich journey, conjuring humour and darkness. What makes the performance shine is its multi-disciplinary story-telling. Monica Dottor’s choreography creates beauty and chaos through the glorious chorus of dancers. Acting as an all-purpose representation of nature, becoming butterflies, salmon, water, and plants, their elegant technical skill – combined with irreverent, explicitly crass gestures – brings freshness and fun to the narrative. While they frolic about the stage throughout, their “dance sequence” moments – including a chase scene by a squadron of RCMP officers – add a healthy dose of humour to an otherwise solemn subject. Bears speaks back to many forms of power, and from the comments in the talkback afterwards, touched many of the spectators. While I was not moved emotionally, I felt intellectually and personally challenged by the questions the ensemble raised. I reflected upon the political, emotional, and environmental distance between the Indigenous people described in Mackenzie’s narrative and my non-Indigenous self. To leave this show with important questions marks its value, and its success. It would be remiss not to mention that despite its surrealism – from the dancers to the roughly hewn mountains of T Erin Gruber’s design – Bears aims at real targets. Like the protagonist, who explores both human and ursine perspectives, the play itself serves to address inequities and injustices that are distinct but inherently entwined. 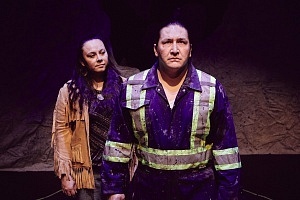 With the Kinder-Morgan Trans Mountain Pipeline situated as antagonist to the Canadian wilderness, the play raises questions of nature and modernity, the relationship of Indigenous people to the environment, and the industries that cannot guarantee its safety. Bears asks the audience not just to feel, but to think, and bears the torch for a new era of diverse, challenging work in Canada.